The THVC team approached this application with professional scrutiny to ensure confidence in using one pump to transfer so much water at high discharge pressure. Surprisingly, many engineers and the mine foreman in North America were unfamiliar with the reliability and cost benefits of PC pumps. Mining operations in the U.K., Europe, Australia, Asia and Africa have used PC pumps for decades in dewatering applications. PC pumps are ideal for dewatering because of their high reliability and life because they operate at a slow speed, reducing wear caused by abrasive particles, and their ability to handle solids in the fluid. This application of PC pumps at THVC demonstrated the difference in reliability between the 3,600-rpm centrifugal pumps and the 450-rpm PC pump. PC pumps are positive displacement, so they continuously generate discharge pressure at different flow rates, regardless of pump speed. To improve the efficiency of the dewatering effort at the THVC mine, one progressing cavity pump was chosen to replace the five-pump centrifugal system, resulting in a $160,000 reduction in maintenance costs. 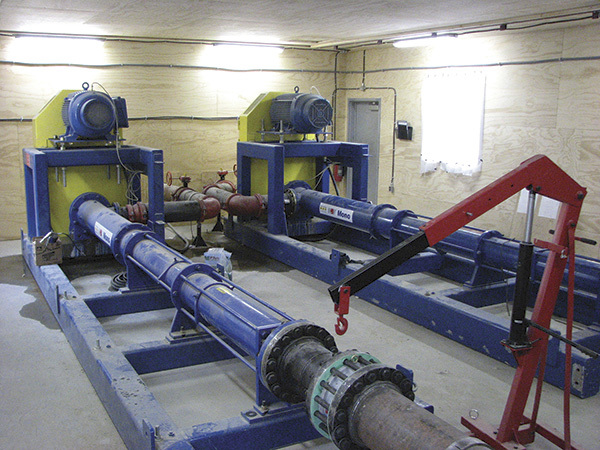 Once commissioned, the dewatering system exceeded expectations. Rather than the monthly maintenance and replacement performed on the original centrifugal pump system, the PC pump continued to operate reliably and cost effectively. The pump continues to run successfully after more than 18 months of continuous service. THVC’s senior foreman knew he was on the right track when Teck management asked how the maintenance budget was under-spent by an average of $15,000 per month. After explaining that the maintenance budget for the dewatering system was now negligible, the senior foreman was encouraged to use this PC-pump technology in new applications throughout the operation. THVC’s chief executive officer recognized the senior foreman for his innovative vision and creative problem solving. Jim Putnam is the director of Strategy & New Product Development for NOV Mono. He holds a Bachelor of Science in business administration/management and a Six Sigma Black Belt certification from Motorola. He has more than 25 years of experience in consulting and global rotating equipment manufacturing, managing operations, engineering, sales, marketing, IT and product design and development. In addition, Putnam has experience in remote monitoring and diagnostics software development for large capital asset equipment. He may be reached at 281-854-0300.